Encouraged by the continued success of the original MeArm kit, a pocket-sized robot arm that quickly became one of the most successful of its kind for budding Raspberry Pi enthusiasts, the Bens (Gray and Pirt) are back with a new Kickstarter project: the MeArm Pi. The original MeArm project was designed to be simple and open-source, requiring just three ingredients: servo motors, screws, and the laser-cut parts. This allowed the design to spread around the world, quickly appearing on every continent except Antarctica! It was massively successful, and is still popular. Children loved it, but we could see that many parents were scared by the complexity of the build. We’ve tried to keep the workings of the MeArm as straightforward as possible. The servos are driven directly from the GPIO pins. The joysticks use an I2C ADC to communicate directly with the Raspberry Pi. There’s an on-board RGB LED, driven directly from the GPIO pins, so that if you want to play around with it, you can. We’ve found that the standard 2A Raspberry Pi power supplies work without any issues, but if you’re plugging more things in you might consider using the 2.5A supply. The HAT has a micro USB power input, so the same power supply will power both the arm and the Raspberry Pi. The HAT follows the reference design for Raspberry Pi HATs. We’ve written a Node.js app to perform a few key tasks, including controlling the servos in the arm via the GPIO pins, and reading the state of the joysticks via the ADC. It’s all open-source. We’ll continue to develop the library, adding new features based on your feedback. 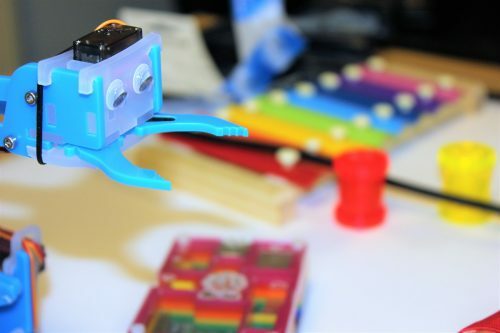 We think this is a great kit for anyone wanting to step into the world of digital making, regardless of their age or experience. We’re not alone: the Kickstarter backing target was met, and doubled, in just a few days. If you’re interested in learning more about the MeArm Pi, visit the Kickstarter page. The campaign will run until March 8th. Good luck, Ben and Ben! This sounds really good, perfect for the robotics I’m currently doing with the Cub Scouts. I heard about this yesterday and backed it as soon as I could. I’ve written a GUI / touchscreen application for the Cebek Arm and I think it will be good to add support for this as well. I want to see this little arm actually doing some soldering! I think that bit of the video was meant to be tongue-in-cheek ;-) You’ll never have enough accuracy with this kind of low-end robot arm to actually do any soldering. Still looks like lots of fun though. Love it! Soldering not, but some other movements for sure. Code your own driverless race car with Pi Zero and PiBorg!